Bottom Line: A thorough mix of genius and asinine design decisions if there ever were one. It's sleek and lightweight, but Kyocera owners don't have anything to worry about...yet. CellPDAs are finally coming into the mainstream limelight. Unfortunately, though there have been several product offerings in the past, including the Samsung I300 and the Kyocera QCP-6035, none has really achieved widespread market recognition. Ultimately, it seems that in order for cellPDAs to really take off, they need a big-name push behind them. Enter Handspring. In a market that analysts were calling "saturated", Handspring had many good selling points on their Visor line, but wasn't exactly leading the pack with innovation. As a matter of fact, Handspring's success seems to be more about doing what's already been done right, and not setting out upon new territory. Well, funny that we'd mention the size of said shoes...as the Treo is simultaneously huge and tiny. From the comparison picture below, you can get an idea of the size of the Treo compared to other cellphones and organizers. It's easily the tiniest Palm, but this fact can also work against it. It has a flimsy feel to it at times, and at other times, it feels very solid. Of course, big things come in small packages. Let's take a look at the Treo's specifications. As you can see here, it offers a pretty good feature set for a cellphone. Upgradeability to General Packet Radio Service is a nice feature, but I question its relevance, as GPRS is still quite some time away from market adoption, and the Treo 180 could be in the history books by the time it's out. Of course, the phone specifications are only half the story with the Treo. Let's take a look at some of its PDA features. Includes Handspring standard upgraded Palm software, including Phone Book+, Expense+, Date Book+, CityTime world clock, Advanced Calculator, and introducing Blazer and One-Touch Mail. The processor is a 33MHz Dragonball VZ, but it still felt significantly slower than both the Kyocera QCP-6035 and the HandEra 330. Otherwise, the Treo 180 positions itself pretty well as a Palm-based PDA, with a slightly thicker body than the Visor Edge. The Treo 180 also has twice as much RAM as the leading competing cellPDA, the Kyocera. The key here is to recognize how well the features of the phone side and the Palm side go together. Let's take a further look into this, starting with the hardware. One of the first things any Palm veteran will notice after examining the Treo 180 is the departure from the Graffiti writing system, and the inclusion of a keyboard. Handspring says that the keypad is the way of the future of personal communicator devices (Note: Both PDAs and cellPDAs). After using the Treo 180, I suppose we can agree to disagree. Typing with the keyboard was notably faster than using a stylus, but it had several drawbacks to it. First off, if you get a Treo, read the manual for your own sake. You'll save a lot of time by learning the keyboard shortcuts for basic functionality as opposed to taking out the stylus every time you need to hit "OK" or "Cancel". Admittedly, Handspring did a really good job of trying to make the keyboard as functional as possible with the Treo 180. For instance, examine the layout of the keyboard and note where the phone number pad is. One could argue that it should be as close to the edge of the phone to aid in dialing, but there's a reason Handspring put it there. Normally, if you want to type numerals, you have to hold down the blue function key while hitting the numbers with your right thumb. However, if you want to simply stop what you're doing and dial a phone number to call, just start hitting the buttons. The Treo will analyze your gibberish typing and figure out that you're just trying to make a call, and it will go ahead and switch to the phone application after you're about halfway through dialing the number. Smart. Also, navigating through the interface is made as simple as possible. Keyboard shortcuts for Home, OK, and Cancel, can all be used by holding the function key and hitting Right Shift, Enter, or Backspace. This makes phone operation with two hands relatively painless, since that's likely how you'll be holding the phone most often. Alas, it's not without its problems. First off, there's no way to move the cursor. If you've been typing like mad in Memo Pad and you discover an error (You'll make them a lot) four lines back, you'll have to dig out the stylus, select the position, backspace and correct, and then put the cursor back where you were. And forget about cutting/copying/pasting without the stylus. Maybe other users won't use those functions as often as I do, but judging by the size of the keyboard, they'll definitely make mistakes. And that is a problem. This keyboard is so small, the Keebler elves would have problems typing on it. I have rather smaller-than-average hands and finger sizes, and I had my bouts with the keyboard trying to correctly type phrases and whatnot. One thing I believe would have greatly aided typing with the keyboard would have been to make the keys concave instead of convex. One of the more frequent problems I had was with pressing more than one key, or pressing the wrong key as my finger slipped off one button and hit another. Concave keys would not only reduce the chances of this occurring, but it'd also enable Graffiti nuts like me to touch-type with the stylus if we're doing a lot of stylus-intensive operations. Ultimately, that's part of what it boils down to. One of the big draws of the Palm platform is how well it can be managed with a stylus, and the openness of the platform. With close to ten years of independent software development oriented around stylus-use, many commercial and shareware applications simply aren't going to work as well because they're geared for use with the stylus. Handspring is definitely taking a chance here. If you don't want to take the chance yourself, you can opt instead of the Treo 180g, which ditches the keyboard in favor of the traditional silkscreen. However, don't count on seeing such generosity in the future; Handspring hath decreed that no future Treo models are planned with Graffiti. It's strictly keyboard from here, folks. Well, now that I've dwelled on the keyboard for an overly long amount of time, let's go into the rest of the phone. Don't worry - It gets a lot better from here. If there's one thing the Treo is loaded with in spades, it's style. The Treo got many a look from co-workers and passers-by as they saw me using it. We don't need any trendy interchangeable phone plates or leather cases for this one. It's attractive all on its own. One very nice feature that Treo included that works very well is the screen cover. Most cellPDA manufacturers have had a difficult time coping with the fact that when you're gonna use the phone, you're gonna get your greasy, grimy, geeky cheek all over the screen. That's not to say that the possibility is gone with the Treo, because it's not, but it's far less likely due to the construction of the phone, and the way you'll wind up holding it. I always felt like the phone was fragile when I was talking to people on it, so I held it by the screen lid between my thumb and my least two fingers. It was pretty stable there, and my cheek never touched the screen. On the downside, though, the edges of the phone can feel kind of sharp against your ear when you apply pressure on the phone lid…and the speaker is so tiny that you might have to slide the phone around a good bit on your ear before you can hear it. This led to some definite comfort issues. I think Handspring could've improved this slightly by making a thin black rubberized edge around the lid. This would have helped seal dust from getting inside while the lid is closed, and it'd keep your ears from getting sliced. Of course, you can circumvent the speaker/lid problems altogether and use the included custom earpiece. The Treo 180 comes with an earphone plug with a small bob dangling about a foot down from the speaker. On one side of this "bob" is the microphone for the Treo. Don't let the size fool you - It'll hear you. I'm generally a pretty quiet speaker on the phone, and nobody had a problem hearing me when I was using this. On the other side is a small button, which you can use to answer your calls. 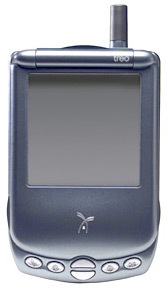 A unique feature found in the Treo 180 is the ability to control how your calls get handled without the caller's knowledge. Let's say someone calls you - You've got four options. You can answer the phone by hitting the button on the bob. You can tell the phone to ignore the call and just continue ringing on the caller's end, while it won't make any noise on your end. Also, you can send it immediately to voicemail. The fourth option is, of course, to do absolutely nothing, and to be content in your decision of inaction. The earpiece was functionally good. I'm not sure if it also behaves as an antenna extension when plugged in, though, as most portable radios do. If this is the case, then this might need to go back to the drawing board. Whenever the earpiece was plugged in, my reception was consistently shot to hell. If I unplugged the earpiece and resumed normal talking, it worked fine. A third conversational option exists in the speakerphone system. I didn't test this a lot though, primarily because the speaker couldn't get loud enough, and there didn't seem to be an easy way to enable/disable speakerphone without pulling out the stylus. A keyboard shortcut would've been highly useful. 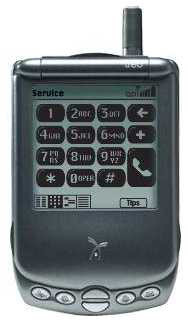 The Treo 180 features a jog dial, not unlike the Kyocera QCP-6035. Like the Kyocera, however, it doesn't serve as much functionality as it could. It primarily serves as a phone support tool, where it works well. To quick-dial numbers that you've set up in advance, simply push in the shuttle to turn the phone on (or open the lid), select the number, and push the shuttle in again to dial it. The Treo 180 took fewer steps to accomplish this than the Kyocera did, which was good. Unfortunately, you only get ten primary quick-dials before you have to scroll the screen. You can store fifty speed dials in all, but honestly, it's not really a "speed dial" if you spent thirty seconds scrolling through names to dial, is it? The Treo surpasses the Kyocera in speed dial functionality, though I would've liked to see better implementation of the jog dial, similarly to what Handera's 330 does. With the Handera, you can select and start apps with the shuttle on the Home screen, and also give OK/Cancel responses with it. The Treo simply scrolls the apps page, but you can't start apps one-handedly. At the top of the feature are the ringer/power controls, the antenna, the Infrared transceiver, and the power/service indicator. Not really a lot to say here, except about the power switch. Its operation is rather…inconsistent. From the manual, one push turns on the phone. If the phone is on, one push turns it off. Two pushes turn on/off the reverse backlight, and holding the button activates/deactivates the antenna. I frequently found myself powering the phone off or disabling the antenna when I simply was trying to activate the backlight, though. It was rather problematic. Your mileage may vary, of course. Oh…and let's not forget that while the backlighting makes the screen visible, it does not make the keyboard visible. This oversight has been remedied in the forthcoming Treo 270, which offers a backlit keyboard. Battery life seemed rather short to me, though when I checked it against a clock, it figured right around its specified time of 2.5 talk-time hours, and around 4 days of inactive transmitter. That's a good bit shorter than the Kyocera, which offers 4 talk-time hours and 150 standby hours. You'll definitely need to keep this phone on the charger when you get the opportunity. Since the Treo doesn't include a cradle, but instead uses a charging cable, you'll probably need to make a conscious effort to plug it in regularly, instead of just dropping it in the cradle like you would a Visor. So, here's where the real meat and potatoes of the phone are. Any schmuck with venture capital and Krazy Glue can put a cellphone and a Palm together. It takes real genius to make it work sensibly and functionally. And this is the department where the Treo really shines. If it seems like I've been harsh on the Treo up until now, don't worry…It's relatively smooth sailing from here. For starters, Handspring's traditional Address Book+ is back, but now under the guise of Phone Book+, certainly more appropriate for the phone. Handspring revamped the contact display modes to allow for easier viewing depending on what kind of info you're looking for. For instance, if you're trying to scan for someone's phone number, there's a mode that shows strictly phone numbers in a condensed view, while another mode is available which displays the default contact mode, be it e-mail or an office phone number or whathaveyou. Also, unlike the Kyocera, if you click on a contact's phone number, the phone confirms that you want to dial it, instead of simply plowing on along. I find this to be useful, as I was always accidentally dialing people on the Kyocera. Also, you can add new Phone Book+ entries directly from the Call Log, and it will fill in automatically the information that was transmitted with the call. Very convenient. Phone Book+ also acts as the dialer application, which includes an onscreen dialpad if you wish to use your stylus. One critical feature it seemed to lack was a redial button, though. With the advent of SIM cards, portability between devices is now quite a bit simpler. The Treo includes some good SIM management tools that allow you to migrate phone numbers between the phone and your SIM card, in case you're getting the Treo as a replacement or substitution for your old phone. Given the current market situation, this is a good thing, but ideally in the future it'd be nice if contact information besides the name and phone number could be stored in a SIM. This isn't Handspring's fault, of course, but it limits the SIM functionality quite a bit, to the point where it's only useful if you're upgrading phones - It won't help you move from the Treo to a newer phone, other than transferring your basic account settings. Also, the SIM tool needs multiple-item selection capability so that I can move all or a group of contacts at once. As it was, copying phone numbers to the SIM card got to be rather tedious, and I only moved about 30 of the 200 or so that I have. The Treo also supports the booming SMS feature. Truth be told, I know plenty about SMS, but I didn't get to use it much in practice, since I don't know anyone with an SMS-capable phone (other than myself with the Kyocera, anyway). I know how popular SMS is, especially in the UK. This is one area where the typing speed of the keyboard is definitely a boon, though even Graffiti is faster than using the triple-punch telephony buttons on your run-of-the-mill Nokia 6161 or whatnot. I did get a little bit of experience with SMS during my time with the Treo, though - I got woken up twice by late-night SMS spam messages. 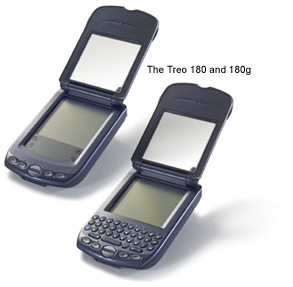 The real draw of the Treo 180, however, is its wireless Internet access. Though GPRS isn't yet available, the Treo 180 will conduct modem sessions over the wireless signal, allowing you to connect to the Internet on your phone. To hear current cellphone manufacturers talk, cellphone Internet connectivity is the wave of the future…Unfortunately, none of them seem to be able to get an implementation that's worth using. Kyocera, Samsung, and Handspring have all had the excellent idea of building upon the existing Palm platform and its cadre of Internet applications. So, in short, what sets the Treo's wireless access apart from its competing offerings? Speed, and applications. Previously I've used Eudora and Eudora Web. Though I don't much care for Eudora's desktop mail application, the handheld suite is generally good. Mail management is efficient, and Eudora Web, well…works. The singular drawback to Eudora Web is that it's slow, and only supports text. A couple of other small caveats exist with Blazer: namely, you can't have more than one page open at a time, and while it renders text before graphics, allowing you to functionally read pages while it's still loading content, it seems to have some difficulty doing this with dynamically generated pages, particularly on messageboards. It's almost a trivial matter, though, and it happens rarely. On a whole, it's leaps and bounds beyond existing web browsers for the Palm platform, and it's something I'd definitely pay money to use on other platforms. The e-mail application provided, One-Touch Mail, isn't particularly noteworthy. The folder management tools don't work, and compared to the speed of Blazer, it's painfully slow. Downloading ten normal plain-text messages took around two or three minutes. Though Handspring bundles One-Touch Mail with the phone, there is an alternative available: Treo Mail. Treo Mail is an annually subscribed service offered by Handspring that works very well. It comes in a personal and a corporate edition, and essentially, it's a manageable e-mail server. Treo Mail lets you configure mail filtering rules and prioritize your e-mail downloads so that you can download only the mail that's important to you. The Treo Mail client is also highly optimized for the Palm platform, and it downloads messages *much* faster than One-Touch Mail. The personal edition (Called "Internet Edition") costs $49 per year, and copies e-mail from any publicly-accessible POP3 server, hosting it specifically for your Treo to access. The Treo Mail client program can be set to automatically go online at intervals, and download new mail. You can also specifically request only messages from certain senders, or within a certain number of days. It reduces your airtime consumption (and battery, if you keep the transmitter off frequently), and reduces your wait time for mail. The corporate edition, at $100 per year, is designed for use with Exchange or Outlook e-mail systems on intranets, can send your phone SMS messages to notify you of new mail, and requires a running Windows PC to act as a mail relay via the Internet. One thing to note about the Treo's Internet access is that your signal quality meter isn't a good indicator of your bandwidth. I've had the meter all the way to zero, and I was still able to browse fine. On the other hand, I frequently had problems establishing a connection. The call would seem to timeout, but the phone would just sit there attempting to connect, sometimes for as long as five minutes. I started hitting Cancel after 30 seconds, and manually redialing. This may simply be a factor of cellphone signal quality in my area, however, so your mileage may vary. Once I got connected though, I hardly ever lost a signal. As a phone, the Treo 180 doesn't really operate with the same comforts and features/functionality as the Kyocera QCP-6035. When you start dabbling with the Internet connectivity, however, that's where this phone starts to shine. It's small and stylish, and definitely draws attention. On the other hand, at times it feels flimsy, and you're afraid to drop it. Many mainstream media outlets seem to have cast this phone as being highly revolutionary...but given the fact that most of its features were already implemented in other cellPDAs, I would hesitate to say that. On the other hand, its wireless Internet access is quite improved upon other models' implementation, and it has some other sensible improvements beyond current offerings. I would sooner call it evolutionary as opposed to revolutionary. This isn't a bad thing, of course. Handspring has a history of letting other companies venture forth with decent offerings in new technology, and following up with their own product which is smartly done, and fixes the problems that the other products had. 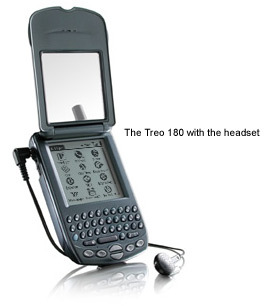 The Treo 180 is an interesting product offering, and it's certainly an excellent product for people looking to trade up from a plain ol' cellphone, or for customers who have something pre-dating the Palm m505 or m125, or even users of the Palm VII and m70x series. For people who have already jumped on the cellPDA bandwagon, though, there's probably not enough new here to warrant a switch.